Sonya Boloski is coming up to her 24th year as a Girl Guides leader. Her years leading young girls and women have highlighted the importance of hearing children’s voices on respect and equality. “Girl Guides have been a big part of my life,” Sonya said. “As leader and mother of three daughters, one of which who experienced domestic violence at the hands of her own partner, I know the effects it has on young girls and women. “Last year I attended the Together We Can summit and we decided that the best way to highlight young people’s perspectives on family violence would be to display them on school and community buses. 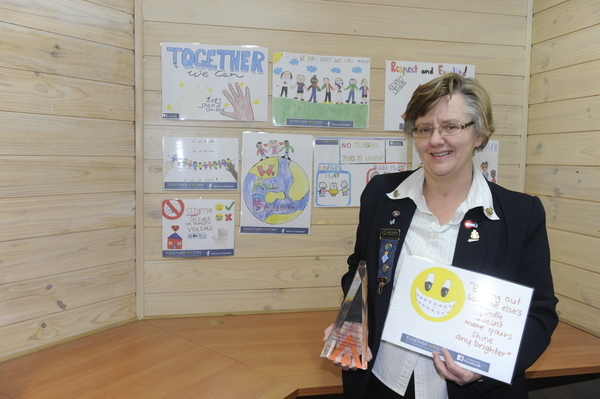 On Monday 11 June, three judges – Bass MP Brian Paynter, Cardinia mayor Collin Ross and respected local business woman Joanne Staindl-Johnson – were invited for the selection of the winning posters at Pakenham Girl Guides Hall. The judges selected nine posters out of 46 posters, three of which were from St Patrick’s Primary School and two each from the other three schools. “Each school got same brief, yet the kids each came up with really different concepts. “Some were so awesome and the whole exercise generated important conversations about family violence in the classroom which is fantastic. Sonya believes respect is a crucial first step in raising a violence-free generation. “My big push is on respect, my whole aim for this year and next is not only to teach kids to show respect to adults, but also adults showing respect to kids. “If a teacher shows respect to their students, then they are far more likely to want to show the same respect back.